Description: Delicately etched of Solid Brass, graceful Maple Leaves accent this stunning oblong fixture. 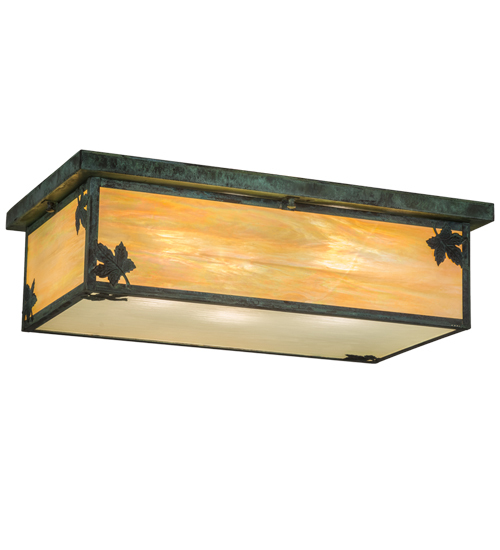 Handcrafted of Beige Iridescent art glass with Frosted Rain Glass on the bottom diffuser, this fixture is enhanced with decorative accents and hardware featured in a Verdigris finish. The Craftsman Signature piece is created by Meyda artisans at the foothills of the Adirondack Mountains. Custom sizes, styles, colors and dimmable energy efficient lamping options are available. UL and cUL Listed.